"This is only the beginning! 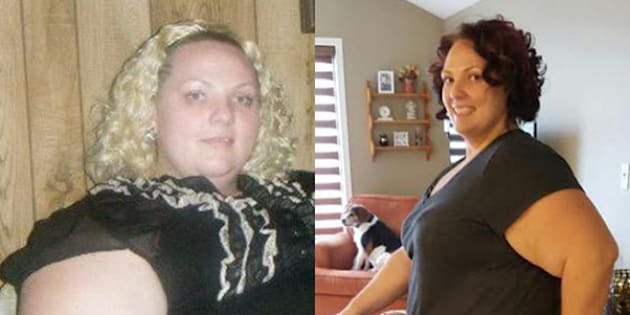 I feel incredible having lost over 100 pounds." By The Numbers: 388 pounds at my heaviest, currently 278 pounds, for a total weight loss of 110 pounds. The Weight Gain: I was an average-sized child, but when I was in my mid- to late twenties, my weight went well into the 200s. I'm not making excuses, as my diet was never great, but I also unfortunately experienced three separate motor vehicle accidents that required time off work, limited physical exercise and physical therapy. It reduced my mobility, and coupled with a poor diet, the pounds began to add on quickly. I suffered some mild depression as a result and used food as a coping mechanism. At that point, I tried several diets. My parents paid for Beverly Hills Weight Loss Clinic on two occasions, I used Dr. Bernstein and other over-the-counter diet pills. I tried watching my weight and joining gyms, unfortunately nothing was consistent. I would lose 10 pounds and gain it back. Final Straw: I was 370 pounds in 2013. I had gone through a horrible time. I had lost five family members in six months, three of which were grandparents. I just cried and ate. Less than a year later, I was 388 pounds. I thought I was doomed to fail. I mean, if I couldn’t even make a weight loss surgery work for me, then there is no hope. I contemplated suicide every day. I thought about how much money I spent on the surgery and the cost of a funeral that my parents would incur. I had a plethora of health issues, heart disease, pre-diabetic, high blood pressure, anxiety, sleep apnea, and insulin disorder. I felt like I had failed at being human. I questioned how I let myself get this way. I started by seeing a naturopath who put me on a Paleo Mediterranean diet (lean proteins, green, leafy vegetables, lentils and no dairy or sugar). The Plan of Attack: It started with diet. It was small, one to two pounds the first week, then five pounds, then eleven pounds. Before I knew it, I had dropped 15 pounds in my first month. 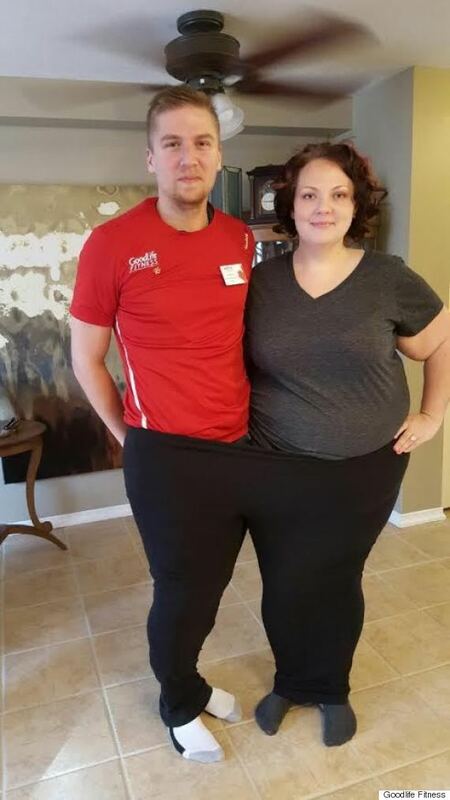 "I didn’t even care about losing 100 pounds at that point. I cared about no longer weighing over 300 pounds. When I finally hit 299, I cried and took a photo." After I had lost about 40 pounds I started thinking about joining a gym but I felt intimidated. It had been a few years since I worked out and I had never been this heavy. I worried I would break the equipment because I was over the weight limit. I finally mustered up the courage to do one session with a Goodlife Williamsburg Kitchener personal trainer Graham Marks. I stayed strong throughout my session, but when I left, I cried like a baby. I needed this session so bad. He didn’t pressure me to do things my body couldn’t physically do and he had a great personality. He was encouraging without being overbearing. That one session changed my entire psyche. It’s been about 16 months since I started this journey and I have lost 110 pounds. I lost about 50 pounds in the first six months, then plateaued. I had to re-start my system and then started losing again. I had lost 70 pounds when I plateaued again. Again, we looked at my diet, my workout program and we tweaked my plan and the weight would come off again. It was monumental to me to break out of 300 pounds. I didn’t even care about losing 100 pounds at that point. I cared about no longer weighing over 300 pounds. When I finally hit 299, I cried and took a photo. The Exercise Factor: At one point, I was up to five training sessions a week with Graham, whereas before I would do two or three a week and rarely went on my own without the training. Now that I have lost so much weight, one of the biggest things I noticed was a change in my cardiovascular endurance. I don’t get winded climbing stairs or walking through a parking lot. I now use this as a benefit. I park farther from stores and walk and take the stairs at work or at the gym. During a productive week, I will go to the gym five times and have one-hour sessions with Graham and one to two hours of cardio on my own. In a less productive week I will do three one-hour sessions with Graham and one hour of cardio on my own. I try to make it to the gym at least three times a week with or without Graham. The Food Element: I went for weekly check-ins with my naturopath and kept a photo food journal. One of the biggest things was changing what I ate and how much I ate. I learned to use a small-sized salad plate instead of a large plate to control portions. "I realized what garbage fast food was and how much my body detested having it in my system. It’s been over a year and I still feel that way." Fast food was one of the first things I stopped. I used to eat fast food two to three times a week. After the first few weeks of eating healthy, I thought I would “treat” myself to McDonald's. It made me sick to my stomach, and it was an easy transition after. I realized what garbage fast food was and how much my body detested having it in my system. It’s been over a year and I still feel that way. From time to time, I crave a cheeseburger or I eat at a drive-through due to travel or poor time management and I still don’t enjoy it. I try to order things like salads or wraps now if I absolutely have to eat out. The Current Day-to-Day: This is only the beginning! I feel incredible having lost over 100 pounds. While my weight never hindered my social life and never prevented me from really doing any one particular thing, it has been a much more enjoyable life now. It feels good to fly without a seat belt extension, to go to dinner and know I can fit in a booth. I have no health issues right now and all of the previous health issues have been resolved with the weight loss. I got married in December to a wonderful man and I felt beautiful on my wedding day (something I might not have felt at 388 pounds). I am much more adventurous and playful now too. If I had known the success I would have achieved and had known how great I would feel, I would have started this and taken it seriously long before now. My advice? It might sound crass, but to stop making excuses. People use their health, finances, age, children, etc. as excuses to eat poorly, not exercise and not help themselves. I have done it myself, but you don’t realize you’re only hurting yourself by doing so. I have learned that there are opportunities everywhere. If you can’t afford a gym, then walk. Use your local park or school yard as a gym. While healthier food is seen as more expensive, if you watch for deals or shop at the local market, you can get fresh fruit and vegetables for far less than a meal at McDonald's. CORRECTION: This article has been modified since its date of publication.